From left to right: Lynn Drummond (Chair), Chair of Infirst Healthcare and Venture Life Group, Jane Osbourn, VP of Research at MedImmune and Head of Site, MedImmune Cambridge, Inga Deakin, Principal at Imperial Innovations, Sally Waterman, Senior VP of Corporate Development at Abzena, and Julie Walters, Founder of Raremark. Photo by Nigel Luckhurst, courtesy of Cambridge Judge Business School. How do we nurture growth in the life science sector and ensure the UK is the best place to develop innovative patient therapies in these turbulent times? These are some of the questions that were discussed at the BioBeat16 summit, held on 16th November 2016 in Cambridge. 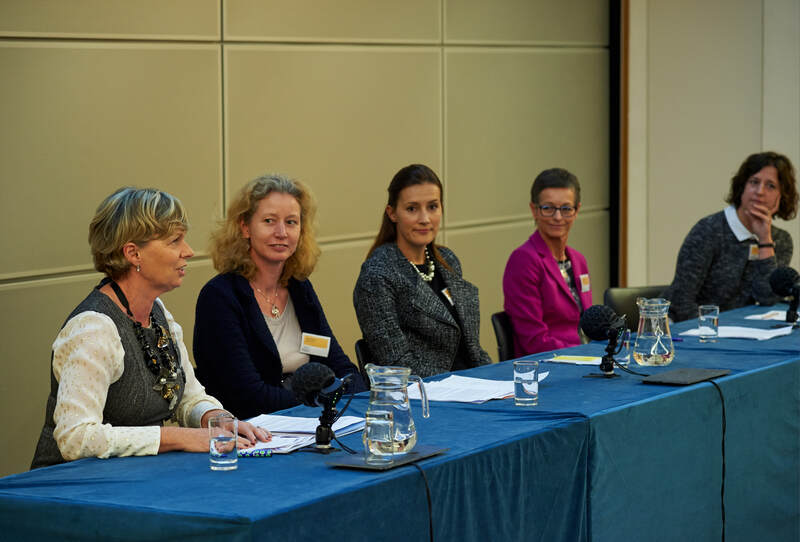 Around 160 delegates, including life science academics, biobusiness leaders, industry experts and investors gathered at St Catharine’s College for an evening of networking and a panel discussion on the theme of Stretching Biotech Pharma Entrepreneurship. Speaker Jane Osbourn opened the panel discussion on promoting entrepreneurship in the life science sector with a reminder of the word’s origins. Though there is no direct translation of entrepreneur from the French, it comes close to meaning adventurer – or rather someone who is willing to take risks. Osbourn is Vice President of Research and Development at MedImmune, the global biologics R&D arm of AstraZeneca and an organisation where entrepreneurship is one of its corporate values. She told the BioBeat16 audience that in order to produce innovative life science that can benefit patients, you need an environment where it’s acceptable for things to not work out as expected: “In order to innovate, scientists need to be able to spread their wings”. Osbourn believes the best way to achieve this is by creating a culture that encourages and rewards sensible risk-taking. However, she says it’s important to carefully manage this: “It’s always challenging to get the balance right, no matter what size your business”. Fellow panel speaker Sally Waterman, Senior VP of Corporate Development at Abzena, focused on the practicalities of turning an idea into a successful business. She agrees that the best entrepreneurs take risks, but calculated ones: “It’s important to identify risky stages when developing a business plan, and take the necessary steps to minimize exposure”. Waterman says careful costing and expenditure control are particularly important in the early stages of growing a business. Waterman appreciates that smaller, academic based start-ups can often lack aspects of commercial or regulatory expertise. However, that shouldn’t be an obstacle to success. “If you don’t have the project management or regulatory knowledge within your own skill set, consider bringing people in who do”. This could involve hiring personnel from a more regulated environment, such as established pharma. One advocate of this model is Angela Russell, Associate Professor of Medicinal Chemistry and co-founder of OxStem, a company that specialises in developing regenerative therapies for age-related conditions. She believes that finding the right management team has been crucial to their success, allowing her to focus on leading innovative research. “We’re extremely fortunate to have found a dynamic CEO and strong management team with a wealth of entrepreneurial experience. We’ve structured OxStem so that each of the four disease-focused subsidiaries within the company have their own founding scientists, which means we have very strong scientific credibility”. She says that this strong scientific and commercial expertise helped them secure sizeable US investment. Also discussed by the panel were some of the innovative ways start-ups can be funded. Inga Deakin, Principal at Imperial Innovations, opened her talk by discussing the increasing range of funding options for early stage companies, both from individuals and networks, such as the Cambridge Angels network and crowdfunding, and from universities working with industry partners, such as GSK, Johnson & Johnson and AstraZeneca working together with Apollo Therapeutics. She says that these flexible funding models help advance programs in preparation for raising the large investment required for research-based ventures, whilst reducing investor risk. Deakin also commented that universities are increasingly recognising the potential of enabling and financially supporting commercialisation and spin-out of research. She highlighted the recently established £50 million University College London’s Technology Fund, which aims to commercialise more of the university’s intellectual property. “Universities and academic staff are increasingly incentivised to realise impact via enterprise in addition to their focus on citations and publications” says Deakin. She also believes that universities can add significant value to the student experience by directly engaging students in a commercial environment. According to panel speaker Julie Walters, “There is no better time to be an entrepreneur, especially in healthcare”. Walters is something of a serial entrepreneur, having founded her third business, Raremark, an online network for people with rare diseases to engage with the wider patient and healthcare community, in 2015. She told the BioBeat16 audience that the latest advances in software engineering and biotechnology are opening up a whole range of possibilities for new commercial activity in the realm of genomics and biomedical data analysis. However, whilst Walters says that securing the seed funding to start a small life science business in the UK is relatively straightforward, she believes scaling to a multi-million dollar enterprise is much easier across the Atlantic, where her sales and marketing operations are based. “To put it into perspective, there’s more money in our building in Boston than there is in the entire UK life science sector”. Walters claims it can take 6 months in the UK to secure the same investment as it would by talking to an investor a few doors down the corridor. Addressing this concern, Osbourn believes that the pension fund space could play an increased role in providing continuing investment for medium sized enterprise here in the UK. Venture capital, with an investment lifetime of around 10 years, could offer a suitable timescale to scale up smaller business and make a return. However, Walter’s point highlights how a strong, interconnected network of scientific and business talent is essential for a strong life science ecosystem. Fundamental to the success of the Massachusetts hub has been the availability of this technical, regulatory and commercial expertise in close proximity. These close links drive innovation faster, which Walters says makes investors more likely to take risks. One of the aims of BioBeat is to provide a platform for such partnerships to be built here in the UK, by bringing together scientific and business expertise, and creating a forum for investors and entrepreneurs to partner, which ultimately brings benefits to patients in the form of innovative treatments. BioBeat16 provoked much discussion around ways to encourage and fund growth in the UK life science sector. The networking event undoubtedly sowed the seeds for new partnerships that may bring future benefits in patient care. Please contact Miranda for information on BioBeat17. We hope to see you next year!